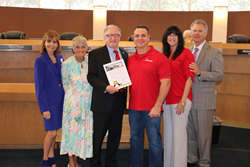 At today’s City Commission meeting, the City of Tamarac, Florida declared May 25 “IQ Formulations Day” in honor of the exemplary work the company has done in the community and its industry. CEO Jay Cohen was honored at this morning’s meeting by Mayor Harry Dressler and several city commissioners with an official proclamation. I sincerely thank the city for this honor and look forward to a bright future for IQ Formulations in Tamarac. 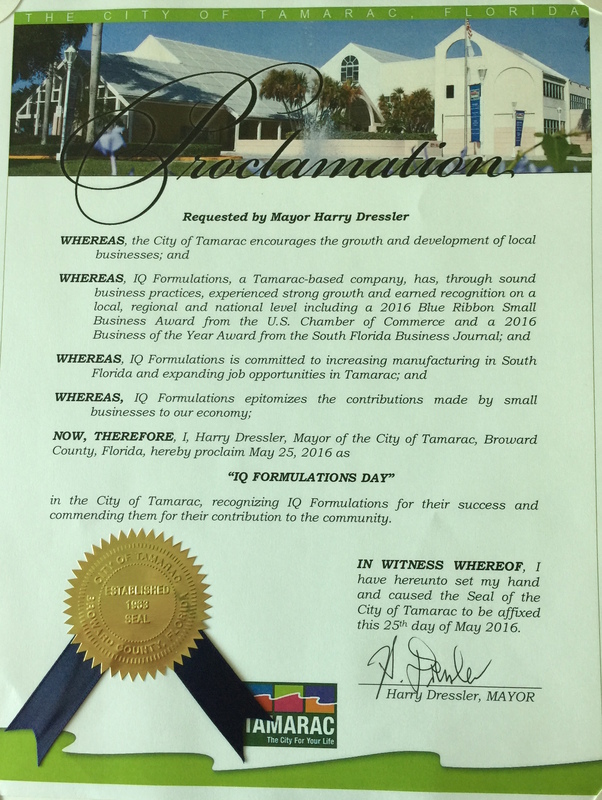 Today, the City of Tamarac, Florida and Mayor Harry Dressler declared May 25 as “IQ Formulations Day” in the city. At this morning’s City Commission meeting, an official proclamation requested by the mayor honored IQ Formulations and CEO Jay Cohen for the company’s sound business practices, strong growth, and commitment to increasing job opportunities in the city and manufacturing in South Florida. The mayor’s proclamation was delivered at the beginning of today’s 9 a.m. meeting at Tamarac City Hall. Following the statement by Mayor Dressler, Cohen said a few words about his great experiences working with the city when moving IQ Formulations’ headquarters there. Cohen was then awarded an official proclamation plaque and congratulated by the mayor and several city commissioners. Today’s recognition from the city follows a number of recent local and national awards for the top health and nutritional supplement company. Last month, IQ Formulations was named Business of the Year by the South Florida Business Journal. Earlier this year, it was also recognized as a 2016 DREAM BIG Blue Ribbon Small Business Award winner by the U.S. Chamber of Commerce. Jay Cohen and IQ Formulations will also be featured in the upcoming issue of Tam-A-Gram, the official publication of the City of Tamarac, which is produced quarterly and mailed to all residents and businesses in the city. IQ Formulations is one of the most highly regarded and quickly growing health and nutritional supplement companies in the U.S. Founded by industry veteran and IQ Formulations CEO Jay Cohen, IQ Formulations is headquartered in Tamarac, Florida. The company has become an industry leader known for its uncompromising commitment to professional facilities, top-quality products with amazing results, and superior customer service. Learn more at iqformulations.com.